There is nothing quite as red, white, and blue as some amazing barbecue in one of the nation’s oldest states. If you are in the mood for some smoky meat, pulled pork extravaganzas, or just want to sit around eating barbecued chicken wings and sipping on some original brews, then you’ve come to the right place. Here are the 10 best barbecue joints in Maryland. This once local hangout has been gaining in popularity as more people take the short trip down Forest drive to the Annapolis Smokehouse and Tavern for some of the best barbecue in the area. Not only do they have amazing brisket and pull pork that will have your mouth watering for more, plus some of the best brews on tap, but they also have award winning chicken wings that you simply have to taste. When it comes to the barbecue experience there are few places that do it as well as Smokey and Uncle Grube’s. Whether you come for the delicious ribs or love the chicken, you will fall in love with the ambiance. From the slamming of the porch style door, the picnic tables where people eat, and the down-home hospitality, this is the place to come if you happen to be in Elkridge and have a hankering for some great barbecue. Mackeis Southern Barbecue, a place where you can get fantastic barbecue made from the finest local ingredients. This is a restaurant that has become a local fan favorite in Gaithersburg, based on the sheer quality of food you can get here. When you factor in the amazing service and friendly staff, and a modern interpretation of classic American barbecue, you have a restaurant that you cannot pass up. If you really have a craving for meat, try their meat by the pound option to buy some smoked classics. For the residents of South County, Maryland there is a place they go whenever they have to eat some local, fresh, and amazing barbecue. That place is the Wagon Wheel Restaurant, a family friendly joint in Churchton. Bring the whole family down to try some local favorites like smoked chicken wings, pulled pork sandwiches, or a burger known as “not your Mama’s burger.” Or stick with a classic like brisket. It is rare to hear of a barbecue joint that brags about its smoked vegetables, as well as serving some of the most outstanding quality meats to come off a smoker. But when you are Fat Pete’s, you have something brag about and for customers, the smoker meat and vegetables is an artisan like experience. These are experts bring the absolute best smoked food, with tremendous service, and a commitment to locally sourced meat and vegetable to satisfy even the pickiest barbecue connoisseur. Open seven days a week, this is the place to go when you need to pick up great meal, or want a barbecue night out with the family. This isn’t one joint, it is four. Serving up some of the tastiest barbecue around, Chef Andrew Evans, has brought his award willing culinary skills to the suburbs of Washington D.C. to wow families all over the state of Maryland. Bring the kids, bring a date, bring your parents, whatever you bring make sure you bring a bib because this is one joint where you want to get messy. Serving barbecue pork, brisket, chicken, and a killer slab of ribs, the BBQ Joint must make it to your list of best places to eat. There are a lot of families, up and down the East Coast, that love to vacation in North Carolina at the Other Banks. If you are one of those families you may have a hankering for North Carolina barbecue. Don’t wait till you can get down the coast. Instead, head to Rick’s NC BBQ where you can taste authentic NC BBQ right here in Maryland. Located in South Anne Arundel County, this joint offers take out of amazing baby backs or pit beef packed with legendary coleslaw. Baltimore has a legendary pit beef stop that was started in 1987 by Gus Glava. The food here is sourced locally and is the freshest, highest quality of meat that has put this joint on the map. It has one of Guy Fieri’s favorite sandwiches, as featured on “Diners, Drive-ins, and Dives.” Chaps was named one of Food Networks “Top Favorite Places to Eat,” and the awards have just kept coming. For someone who wants barbecue that will make you never want to leave, and then come back as soon as you can, go to Chaps Pit Beef and find out what it takes to be an award-winning smokehouse. When you think of Texas, the first thing you think of Texas barbecue in a relaxed setting that harkens back to a slower time. If you are in the mood for cowboy boots, country music, and mouthwatering barbecue then head down to Texas Ribs and BBQ. A cowboy themed restaurant, this place also has some of the best baby backs, steaks, and seafood to offer. Come for the ambiance, stay for amazing food. 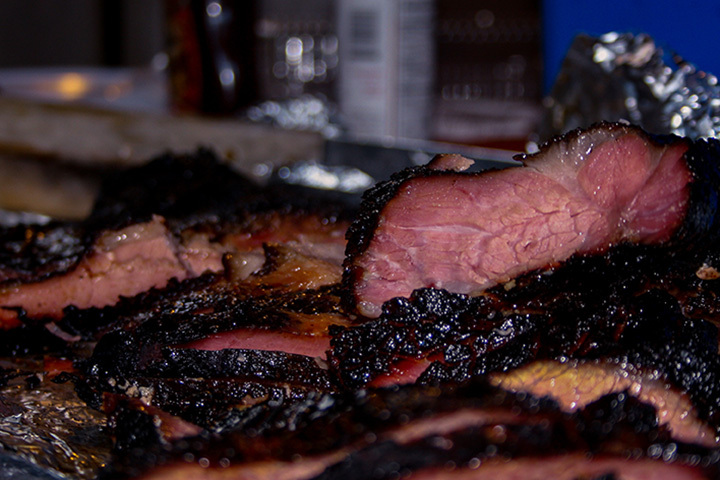 On the Eastern Shore and craving some hot, smoky meat? Come on down to Hot Off the Coals, one of the Eastern Shore’s best barbecue joints. Run by Chef Ric Brice, who has spent the last 40 years tweaking and perfecting his recipes, the love and dedication that goes into his smoking is epic, and it shows. With handpicked angus beef, certified pork and chicken, and baked beans to die for, this is one place you never want to drive past. If the family is coming, there are even options to get slow cooked sandwiches, subs, and salads.